Whatever suits your mood or the conditions best, the Swell gives you the freedom to ride, all day, every day. Pull the bar and feel the kite come to life instantly. Designed for surf, the Swell is Peter Lynn’s answer to riders who like to be versatile. By giving the kite a perfect blend of drift, great turning, low-end power, speed, easy re-launch and upwind drive we combined excellent freeride characteristics with wave specific traits to make sure every session is fun whether there are epic sets rolling in or not. A kite that excels in all conditions, good or bad; as we believe a kite should not be limited to performing in perfect wind and waves only. The balanced Hybrid/SLE shape of the Swell is designed to be stable and offers the precise and responsive handling that both wave chargers and free riders demand. Its lightweight 3-Strut frame offers maximum stability and slack line drift when you want to focus on surfing the wave. Its quick acceleration and deceleration give you power when you need it and the kite’s highly stable drift capabilities let you focus on your ride rather than your kite. The shape allows for a super speedy water relaunch which is a must when riding more serious sized surf or when you’re dialing in that new trick. As we like our kiting experience to be rewarding every time we go out we built the Swell to have an impressive boost and lift, making it easy to bust out some moves on your Twintip. It's smooth and predictable handling, stability, depower ability and controllable lift give the rider a feeling of total confidence right from the first launch. Should you decide to throw a loop, the Swell will definitely surprise you. You will get hooked on its speed and find yourself pushing the envelope. 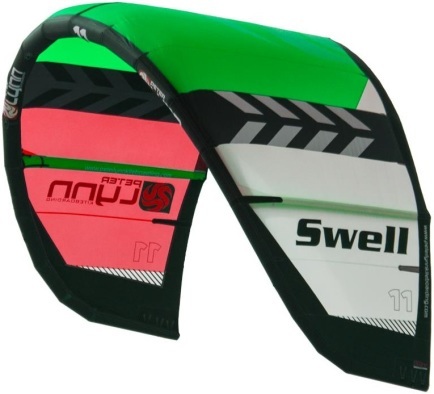 The Swell’s playful handling makes it a fun kite all around. It’s a kite that will give you the confidence to explore new avenues in twin tip freeriding and strapless freestyle. Rolling sets, chop or flat, Directional or Twintip, straps or no straps. Rediscover how much fun and addictive your favorite sport can be with the right gear.